This information applies to British Columbia, Canada. Last reviewed for legal accuracy by Alison Ward in August 2018.
Credit cards, which allow a person to pay for things based on a promise to pay later, follow some basic rules of contract law and raise some special legal issues. Client has lost a credit card and wants to know about liability if the card is used fraudulently. Client has bought defective merchandise with a credit card and wants to know if they can refuse to pay the credit card bill. Client has recently separated from a spouse and wants to know about liability for past and future bills on a joint credit card. Client wants to know how much interest is being charged, and how it is charged, on their credit card. Liability (responsibility) for charges made on credit cards follows the basic rules of contract law. In most instances, the agreement is made between the consumer applying for the credit card and the creditor accepting the application. The creditor issues the credit card subject to the consumer accepting the terms set out in a cardholder agreement. In merchant agreements, the merchant issues its own card to the consumer. Use of the card is usually restricted to purchases from that merchant. For example, most major department stores issue their own cards. In agreements with financial institutions (for example, banks), the creditor issues the card to the consumer for credit purchases at any business accepting the card. MasterCard and Visa are examples of financial institution cards. This type of agreement is really two agreements: one between the consumer-cardholder and the financial institution, and one between the merchant and the financial institution. The consumer is usually held responsible for charges made through both direct use (for example, when the consumer uses a “tap to pay” card or enters their card and PIN number in a merchant’s payment machine) and indirect use (for example, when the consumer gives the card number and expiry date over the phone). Some special legal issues arise with credit cards, both in common law and under statute law. Section 57 of the Business Practices and Consumer Protection Act defines a credit card as being “a card or other device that can be used to obtain advances under a credit agreement for open credit”. A “credit agreement” is defined as an agreement under which credit is extended and includes loans, credit sales, lines of credit, and credit cards, or a replacement or renewal of any of these. Under the Business Practices and Consumer Protection Act, credit cards are a form of “open credit” (the borrower is not borrowing a fixed or agreed amount of money). The Act requires lenders who extend open credit to make a statement available to the consumer in advance that explains the cost of borrowing on the credit card (see the section on Interest and the Cost of Borrowing Money). Once credit is extended, the lender must issue periodic statements showing details such as the total amount credited and the outstanding balance. In most cases, consumers get this information as part of their usual monthly statement. Section 99 of the Business Practices and Consumer Protection Act limits a consumer’s liability for unauthorized use of a credit card. Given the growing problem with credit card fraud, this is an important protection. Once a consumer properly notifies the issuer, the consumer is not liable for any unauthorized use. Before giving proper notice, the consumer is liable for a maximum of $50 in unauthorized charges. The maximum liability set out in the credit agreement may be less than $50, but it cannot be more. However, this protection does not apply to debit cards or when a credit card is used with a confidential personal identification number (PIN) to withdraw money from a cash machine. In such cases, the common law of contract applies. In Plater v. Bank of Montreal, the cardholder agreement stated that the cardholder was responsible for losses up to $500 if the PIN and credit card were not kept separately. Because it was found that the two were not kept in separate places, the cardholder was held liable for $500 rather than the $50 limit specified under the Business Practices and Consumer Protection Act. An important concern for consumers is their liability or responsibility when cards are issued to co-applicants or when cardholders agree to add other users to their existing credit card (see the section on Co-signing, Guarantees and Joint Debts). Liability for jointly held credit cards is not dealt with in the Business Practices and Consumer Protection Act — it is a matter of contract law, based on the cardholder agreement. In general, cardholder agreements stipulate that each authorized user of a card is jointly and severally liable for the debts incurred on the card. This means the creditor can claim the full balance on the account from any of the holders, regardless of how little or how much each individual actually charged on the card. That liability continues at least until one of the parties to the agreement terminates the agreement. Responsibility for the debts of another cardholder may well continue until that cardholder’s card is physically recovered and returned to the financial institution. There may be instances where a unilateral action (such as raising the credit limit and then borrowing to that new limit) by one of two parties responsible for a credit card may not affect the other where notice was not given to the other cardholder. The cardholder agreement may also be written to make the cardholder liable for anyone using the card with the cardholder’s authority. For example, a cardholder might disclose a PIN to a friend to make a withdrawal at a cash machine. Under the terms of the cardholder agreement, the cardholder is responsible for any amount withdrawn, even if it was more than the cardholder had authorized the person to take. The distinction between merchant credit cards and financial institution credit cards becomes important when the consumer has a problem with products or services purchased with the credit card. Usually, the consumer’s reaction is to refuse to pay the credit card bill, or at least the amount on the bill relating to the problem product or service. 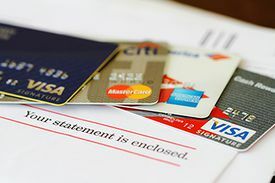 Disputes between a consumer and a merchant over a purchase on a merchant’s own credit card are usually resolved according to general principles of contract law. The parties can negotiate or they can go to court. If the matter goes to court, the court’s decision on the merits of the case governs the liability on the credit card, or at least the credit card purchase. Disputes between a consumer and a merchant over a purchase on a financial institution’s card are more complicated. Usually, the consumer has little right to refuse to pay the bill from the financial institution. Cardholder agreements generally contain terms that mean that the consumer must pay for charges on the card regardless of product or service quality, and that the bank is not in any way responsible for consumer-merchant disputes. However, some cardholder agreements do contain special terms that are essentially warranties or insurance for the purchases made using the card. The type of information you need to obtain is governed by the kind of credit card problem the client has. Generally, you need to obtain a copy of the cardholder agreement, a copy of the latest monthly statement the consumer received from the creditor, and copies of any correspondence between the consumer and the creditor. If the consumer’s problem arises from an inability to pay the credit card bill, refer to the section on Options for Getting Out of Debt. If the problem involves potential liability for a lost or stolen credit card, ensure as soon as possible that the consumer has notified the creditor. Most credit card issuers, including MasterCard and Visa, have special phone numbers that you can call at no charge for reporting lost or stolen cards. It may be difficult to assess the extent of a consumer’s liability on a joint credit card. In the absence of any other defence, the consumer will probably at least be responsible for any debts incurred up to the time that the consumer cancelled the credit card agreement. See also the People’s Law School pages on credit cards. Consumer and Debt Law © People's Law School is, except for the images, licensed under a Creative Commons Attribution-NonCommercial-ShareAlike 4.0 International Licence. This page was last edited on 12 October 2018, at 05:46.